Understand one of the most important steps of a successful paint job so you’ll achieve professional quality results. Q: I’ve given in to my daughter’s request to paint her bedroom pink. Is primer required for a job like this, and if so how many coats of primer should I use? A: Although paint might initially stick to an unprimed wall, you risk blotchy, cracking, peeling results if you pass on primer. Comprised of more resins and less pigment than paint, plus solvent and other additives, primer is applied to surfaces as a preparatory coat to improve the adherence of paint. 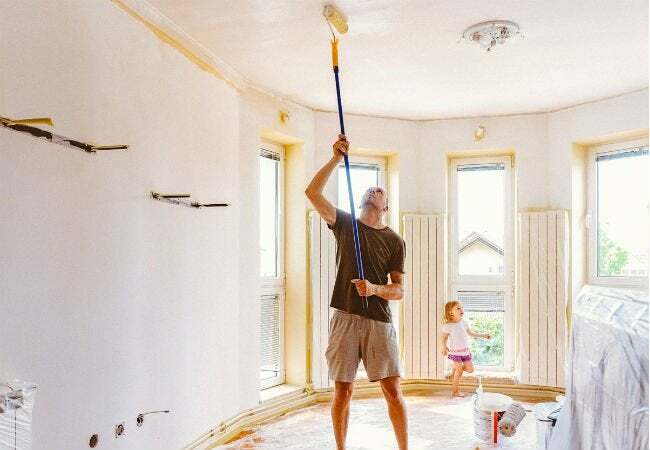 It also limits the amount of paint a surface will absorb, so you’ll need fewer coats of paint for an even finish—a win for your wallet when you consider that primer usually costs half as much as paint. 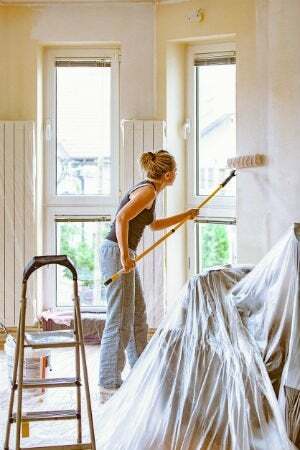 Generally, one to two coats of primer will suffice for painting interior walls, but how many you’ll need depends on the wall material, the paint color, and the type of primer used. Keep reading for the magic number of primer coats for all types of interior painting projects. …painting any color over a white wall. One coat of a high-quality water-based primer (e.g., Zinsser Bulls Eye, available on Amazon) or oil-based primer (e.g., Zinsser Cover Stain, also available on Amazon) is all you need to bind the old white paint and the new shade, mask stains and recently patched/sanded areas, and reduce how much new paint you’ll need for full coverage. …using a tinted primer. Primer imbued with the shade of your new paint is helpful when making dramatic changes, such as dark to light or vice versa, as it brings the wall color closer to that of the new hue. Pick up a can of tintable primer (e.g., Zinsser Deep Tint, available at Lowes) and ask the paint store or paint department associate to bring it up to 50 percent of the new shade. Thanks to the color adjustment you’ll get with a tinted primer, you can often achieve the desired shade with a single coat of paint! …painting unfinished drywall or plaster. Drywall or plaster walls that were never primed or painted will have areas that are more porous than others. These areas will absorb paint at different rates, resulting in blotches. 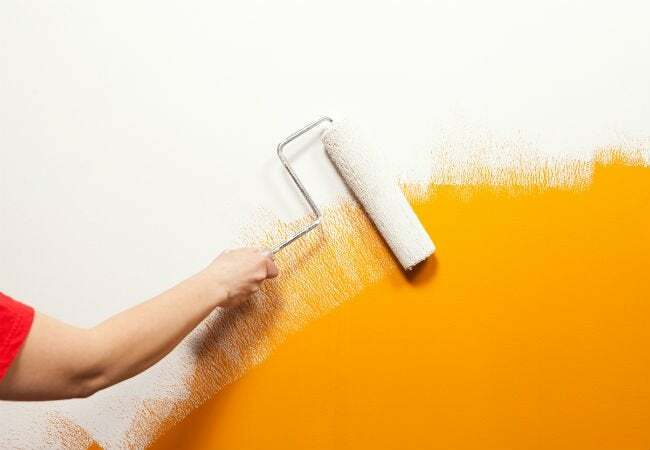 Two primer coats are recommended in this scenario because much of the first primer coat will be soaked up by the wall; the second coat will replenish any primer absorbed by the surface and hide any flaws in the wall. For drywall, apply two coats of drywall primer-sealer (e.g., Behr Premium Plus Drywall Primer and Sealer, available at The Home Depot) or high-build drywall primer-sealer (e.g., KILZ High-Build Drywall Primer Sealer, available on Amazon). Prime unfinished plaster walls with two coats of oil-based stain-blocking primer (e.g., Zinsser Cover Stain) to prevent the lime stains that affect plaster walls from bleeding into the paint. …painting unfinished wood walls. Wood that was never primed or painted is even more porous than unfinished drywall. The percentage of solids in most paint isn’t high enough to fill the pores and flatten the grain, so painting wood without a primer will result in an uneven surface prone to blotches and peeling. Two coats of an oil-based primer are recommended on unfinished wood: The higher solid content in primer can fill the pores, level the surface for painting, and mask any knots in the wood. When water-based primer is used on wood, it has a tendency to cause the grain to swell, so if you do choose to use water-based primer, lightly sand the surface after the first coat to flatten and level it. …painting over a dark color with a lighter hue. Primer is a must when making dramatic wall color transitions from dark to light. Without it, the dark color may continue to peek through even after three or more coats of paint. Your best bet for priming dark walls is with a “high-hide” primer (e.g., KILZ High-Hide Primer/Sealer, available at Amazon) formulated to thoroughly cover dark shades. Apply two thin coats of either white or tinted primer (in an exact match to the new paint hue) to bring the surface closer to the final color and reduce the number of paint coats needed. …using a self-priming paint. Two-in-one paint-and-primer products, also known as self-priming paints, contain a much higher percentage of solids than average paints, producing a thicker coat. Consumer Reports’ top five interior paint picks for 2017 were all self-priming paints, and the most budget-friendly pick, Behr Premium Plus Interior Paint and Primer ($28.97 per gallon at The Home Depot), scored an impressive 4.3 out of five stars from Home Depot reviewers. Keep in mind that individual coats of self-priming paints work best when used over a similar or lighter color; self-priming paint is also best suited to smooth walls in good condition and can take longer to dry than typical paint.